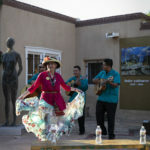 ARTsmart New Mexico’s popular Edible Art Tour is a two night festival of great art and gastronomical delights. 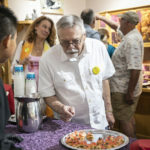 Wear your button (your wearable ticket) and walk and eat your way from gallery to gallery tasting food from Santa Fe’s best restaurants and caterers. 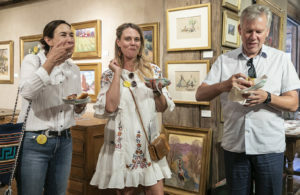 This year Friday night will highlight Downtown Santa Fe galleries and Saturday night will feature Canyon Road galleries. Back by popular demand the Partizani Brass Band will be marching from gallery to gallery downtown on Friday night. Tickets: $45 each, good for both nights. Tickets are $45 per person and good for both nights of the event. Children are welcome to the event and need their own ticket if they plan on participating in the food samples. Tickets are not transferrable (no sharing please!) and nonrefundable. Tickets purchased online up until May 31, 2019 can be mailed to you (add shipping and handling fee of $4.50 per order) as soon as buttons become available. After May 31, all tickets purchased online must be picked up at WILL-CALL at ARTsmart (Mon – Fri 10 am to 4 pm) or at WILL-CALL desk during the day of the event (see below for location info). Purchase Tickets at ARTsmart: Call 505-992-2787 or come to our offices and Community Studio 1201 Parkway Drive. Open Monday through Friday 10 am to 4 pm. WILL-CALL: is for picking up online ticket purchases made after May 31. Located at ARTsmart Offices, 1201 Parkway Drive, until June 13, Mon – Fri, 10 am to 4 pm. Friday, June 14: 10 am to noon at ARTsmart Offices, 1201 Parkway Drive. Beginning at 3 pm on the portal at El Centro de Santa Fe, 102 E Water Street. Saturday, June 15: Beginning at 3 pm at Ventana Fine Art, 400 Canyon Road. New Ticket Booth Tents: Look for our colorful tents located in convenient downtown and Canyon Road locations on the day of the event. Tents will have tickets for purchase only (no WILL-CALL) and will accept cash, checks, and all major credit cards. Friday, June 14: Ticket Booth (also WILL-CALL booth) South of The Plaza: located in front of El Centro de Santa Fe, 102 E Water St. Beginning at 3 pm. Saturday, June 15: Ticket Booth/Tent at The Top of Canyon Road: in front of Globe Fine Art, 727 Canyon Rd. Beginning at 3pm. Ticket Booth (also WILL-CALL booth) at The Bottom of Canyon Road: at Ventana Fine Art, 400 Canyon Rd. Beginning at 3pm. There are NO ticket sales through participating galleries this year. There are NO ticket sales through Lensic theater’s box office this year. You still gotta eat lunch, right? Join us at ELōISA, modern southwest cuisine at the Drury Plaza Hotel, right in the heart of downtown Santa Fe. 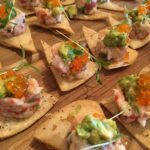 Relax and enjoy a cocktail and delicious lunch before you set out on this year’s Edible Art Tour and help ARTsmart raise money for youth art programming at the same time! (And besides, you’ll be burning off those extra calories when you walk from gallery to gallery during the Tour!) ARTsmart wishes to thank the generous folks at ELōISA for making this possible. Begin your Edible Art Tour here! 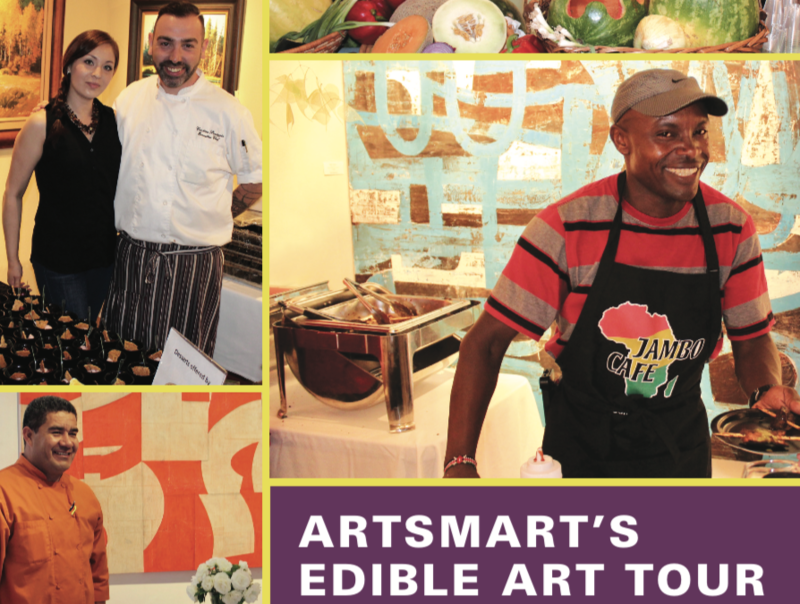 The restaurants that generously participate in ARTsmart’s Edible Art Tour are showcasing their establishment with their food samples and arduously choose what they want to offer during this event. Many times vegetarian, vegan, and gluten free options are available but it is not known before the event if and where such options are offered. 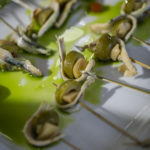 ARTsmart has informed our 2019 participating chefs and restaurants that such options have been requested. Guests with dietary restrictions cannot be guaranteed options to suit their requirements at each stop on the tour and attend this event at their own risk (ticket purchase is non-refundable). Thanks to our advertising partner Santa Fe Selection Travel Guide & Concierge. 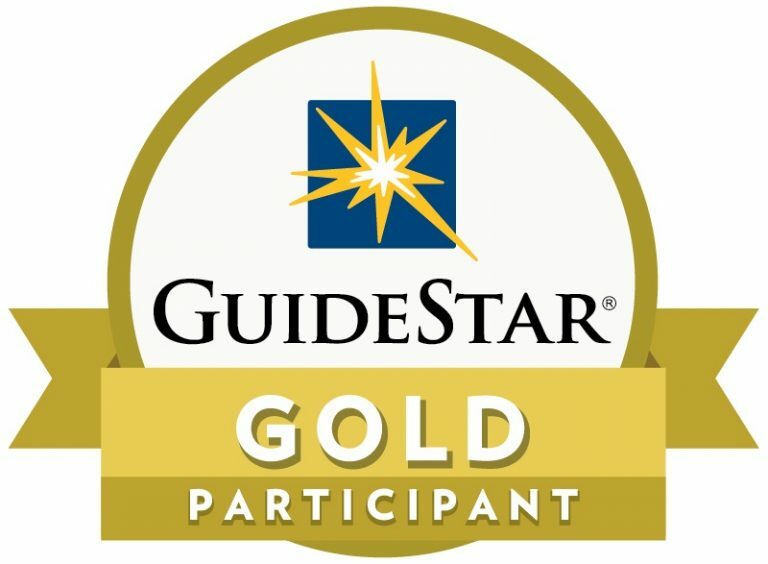 For a complete guide to the authentic Santa Fe experience, restaurants, adventures, discounts on lodging and more, visit their website SantaFeSelection.com.